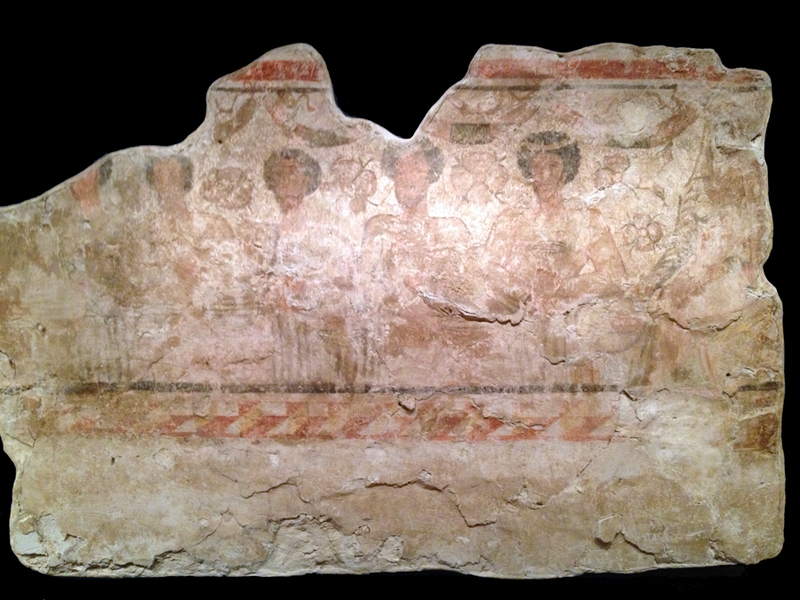 Wall paintings showing private banquets were uncovered by the Yale University Expedition to Dura Europos, Syria. Photographs from the archive of the Yale Art Museum. 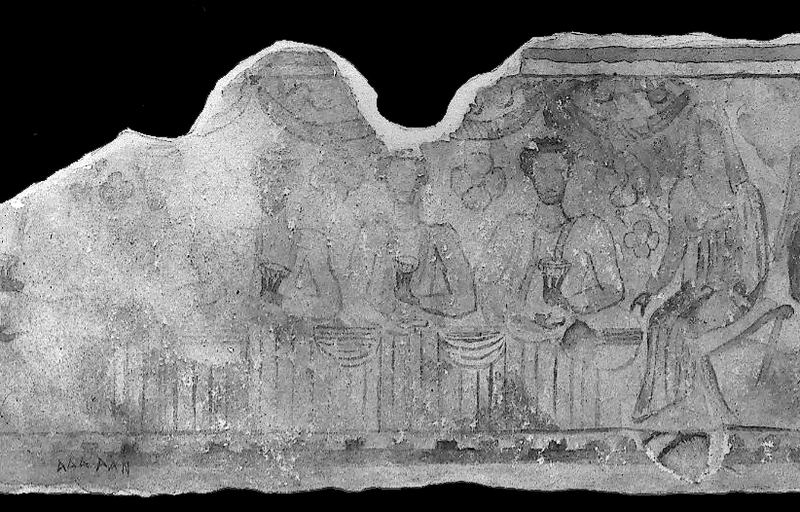 Arts drawing of a private banquet scene uncovered at Dura Europos, Syria. Dated to approximately AD 200 to 256. [Yale University Art Museum Archives]. Photograph taken in the field at Dura Europos by Yale University archaeologists of a wall painting. 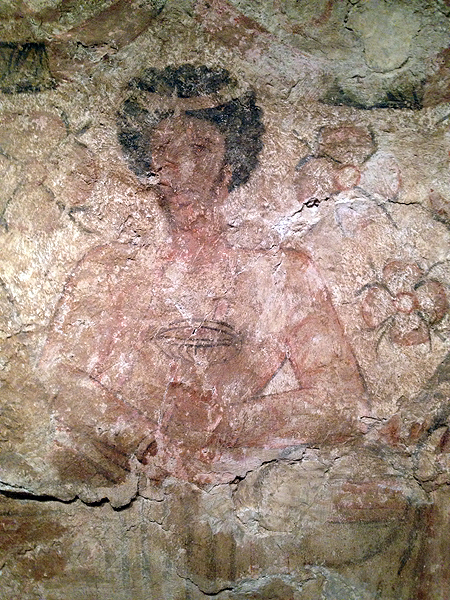 This wall painting was discovered in House M7-W6 (nicknamed the "House of the Banquet" by the excavators. Dated to the late second century AD. [Yale University Art Museum Archives]. Same panel on dispaly in 2014 in the Yale Art Museum gallery. The "House of the Banquet" was discovered near the Palmyrene Gate. Closeup of one of the men in the banquet wall painting in the "House of the Banquet." 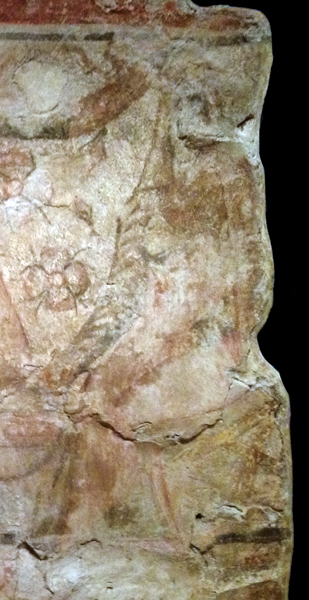 Closeup of the seated woman portrayed in the wall painting in the "House of the Banquet." Photograph taken in the field at Dura Europos by Yale University archaeologists of a wall painting showing a private banquet. Photograph taken in the field at Dura Europos by Yale University archaeologists of the whole painted panel from the "House of the Banquet" which included a hunter on horseback. Photograph taken in the field at Dura Europos by Yale University archaeologists of a painted scene with a hunter on horseback.